If you're moving to the San Jose/Silicon Valley area or considering it, you've found some great communities to call home. We can assist with most company sponsored relocation packages. A Comparative Market Analysis (CMA) of properties now on the market with recently sold similar homes, to assist with negotiating a "best price" offer. Representation of your interests, not those of the seller. We will provide a list of homes currently for sale which meet your specific needs, within 24 hours and will provide frequent updates as new listings come on the market.. Using this form in no way obligates you to use our services. A Free report providing you with extensive information on San Jose . Assistance with such issues as packing, moving & shipping, school selection and utility services. Where Life Mixes with Technology! 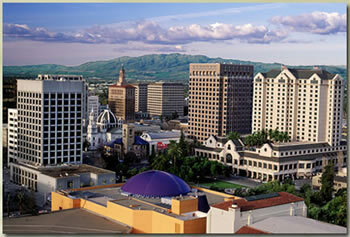 Located in Northern California, San Jose is the third largest city in the state and the 11th largest city in the United States. San Jose has the nation's best public safety record of any metropolitan area, is rich in ethnic diversity, and has a beautiful climate. With temperatures varying from an average of 50 degrees in January to an average of 80 degrees in July, San Jose boasts an average of more than 300 sunny days per year and has a mean annual rainfall of 14.4 inches. San Jose has been ranked as the fifth best place to live in America by Money magazine. San Jose is also the safest large city (500,000) in the U.S. Sunset magazine described our downtown as an "eminently walkable area with level streets, balmy weather and well-marked attractions." Visitors enjoy San Jose's world-class cultural arts, exciting nightlife, theme parks, over 50 wineries within an easy scenic drive, spectacular shopping, superb dining, and great hotels. San José is a City proud of the cultural and ethnic diversity of its population and workforce, and the rich cultural identity of its many neighborhoods. Our residents speak more than 46 different languages. Japantown is a popular tourist stop and a cornerstone neighborhood full of tradition. Biblioteca LatinoAmericana, one of the City's innovative library branches, boasts one of the largest collections of Spanish language materials in Northern California. The City sponsors many cultural festivals, and numerous ethnic chambers of commerce are active in our community. As real estate professionals, we believe it is not only our duty, but a privilege to introduce people to the greater San Jose area and help them make the most of living here. We also know that finding your new home is just one of the tasks that face you when you're relocating. Our goal is to coordinate everything as smoothly and efficiently as possible here, while you're wrapping up the final details of packing up and moving out of your current home. Of course there's no obligation. We believe in making real estate and the relocation process as easy as possible for everyone involved... This means providing information to anyone who wants to find out more about the city they love so much and know so well. So look around on our site and we look forward to helping you any way we can! To help you plan your move, we have put together some other tools that we thought would be very helpful to you. Just click on one of the links below and you will be taken to the website that provides the service. Apartment Search - Need an apartment? This is best place to start looking. Easily search for apartments by price, location, budget etc. Roommate Search - Looking for an roommate to share expenses? This is a great place to start.